The grant is one of many recent developments for the expanding New Mexico-based company Los Alamos, NM—Aug. 1, 2016—UbiQD, LLC, a New Mexico-based quantum dot manufacturer, has been awarded a Small Business Innovation Research (SBIR) Phase I grant by the National Science Foundation. The 12-month $225,000 award is intended to help fund research and development of luminescent solar concentrating glass windows with quantum dot coatings. In July, the company expanded its license to include the proof-of-concept work on this technology, originally developed at Los Alamos National Laboratory, in collaboration with Italy’s University of Milano-Bicocca. “It’s a privilege to receive an SBIR award through the National Science Foundation because it enables us to accelerate our growth and focus on a particularly large market opportunity for our low-hazard, low-cost quantum dot technology,” said Dr. Hunter McDaniel, founder and president of UbiQD. “Our vision is to turn ubiquitous, everyday windows into sunlight harvesters. Think of skyscrapers that power cities.” Until now, UbiQD has broadly explored potential markets for its patented technology, including lighting, security, design, and safety applications; earlier this month the company was issued a patent for “quantum dot security inks.” With this new award and other recent developments, however, the company will focus its efforts primarily on solar energy. “This new investment will further important research at UbiQD to strengthen the intersection of solar energy and advanced materials such as nanoparticles,” said U.S. Senator Martin Heinrich (D-N.M.), in reference to the award and UbiQD’s focus on solar technologies. “It's another great example of how technology developed at our national laboratories can spur industry and create jobs here at home. New Mexico, with its abundant solar resources, can and should be at the epicenter of America's clean energy economy. I will continue to do all I can to ensure this becomes a reality.” UbiQD’s new SBIR grant and technology license are just two of several recent milestones for the company, as they also recently brought on two new employees to the team — Dr. Karthik Ramasamy to lead manufacturing and Dr. Aaron Jackson to lead nanocomposite development. UbiQD has filed several new patents this year, including one related to sunlight-harvesting safety glass windows. 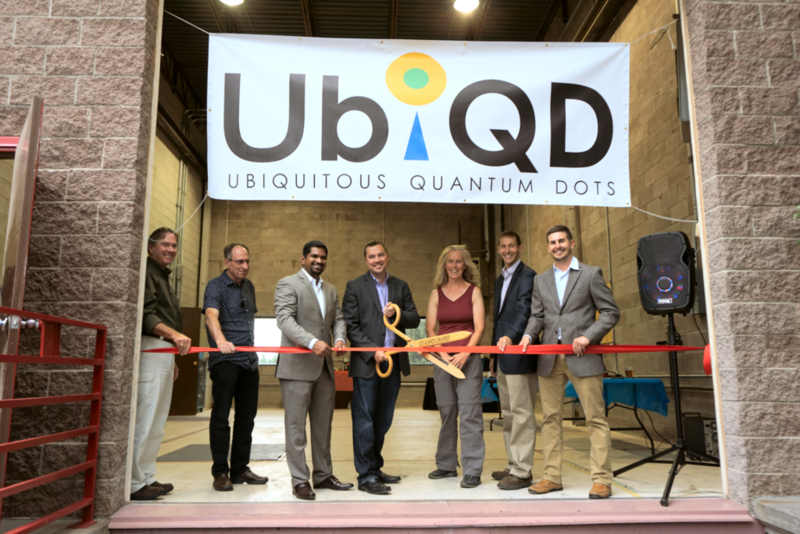 Previously based out of the New Mexico Consortium, in July UbiQD began operating from a newly renovated Los Alamos-based facility. The 9,000-square-foot space allows for scale-up of manufacturing and continued expansion. About UbiQD, LLC UbiQD is a nanotechnology company that manufactures inexpensive, low-hazard quantum dots and nanocomposites in Los Alamos, New Mexico. Quantum dots are particularly advantageous for many applications due to their bright and strongly size-tunable color of photoluminescence — they glow under light — and compatibility with liquid solution processing, which enables low-cost manufacturing techniques. Spun out of technology developed at Los Alamos National Laboratory (LANL) and the Massachusetts Institute of Technology (MIT), the company envisions a future where quantum dots are ubiquitous in a wide spectrum of applications. Today UbiQD supplies materials for development of new products in lighting, solar, security, safety, and other markets. For more information, visit www.UbiQD.com.